The church can be involved in missions on several levels. Here are three. Pooling is pretty obvious. Churches pool their resources, particularly their money… giving them to an outside body, such as a denominational organization or non-denominational mission agency. The involvement of the church in missions is extremely limited. With participating, members of the church go on missions and serve on mission trips. Commonly, the work is short-term with little to no long-term strategy (at least from the church side). With partnering, the church is actively involved in missions work. There is an attempt to be part of the strategizing and planning and to develop a long-term ministry (either regionally or ministerially). I would suggest that a healthy church missions program has all three tiers making a complete pyramid. I think that it is good for churches to support missions outside of themselves. I also think it is good to support short-term mission sites as special opportunities arise. Not everything has to be long-term and strategic. But it would also be good for churches to be actively involved in strategic missions. Ideally, all three exist locally, regionally, and internationally. 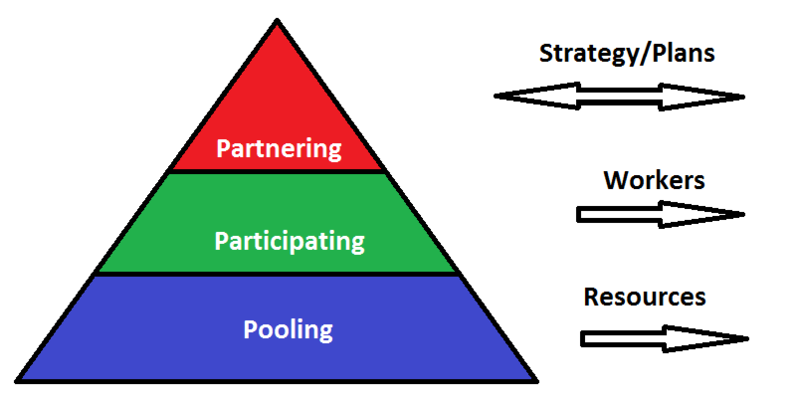 At the pooling level, there is no differentiation between the different regions. However, in participating missions, it starts to matter as to region, and it becomes even more important at the partnering level.